Welcome to Casa di Mario Bonaire. Casa di Mario is a small-scale atmospheric guesthouse, situated in the quiet neighborhood of Belnem, surrounded by a beautiful tropical garden and within walking distance of the azure Caribbean Sea. The guesthouse Casa di Mario consists of a private house and three apartments. 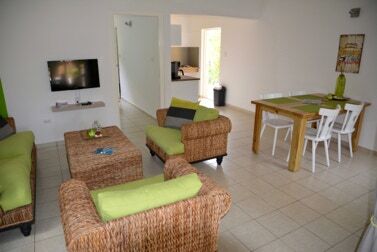 These apartments can be booked with us for a wonderful stay on the beautiful Bonaire. Come diving, snorkel, windsurf, kite surf or just relax on Bonaire and book your stay at Casa di Mario. We are happy to make it an unforgettable holiday for you. Casa di Mario, or write a message in our guestbook. We are very proud that we received the Guest Review Award 2018 from Booking.com. We naturally thank all our guests who have written a wonderful review about our guesthouse !! !